The Apple v. Samsung patent battle1 over specific design features of Apple’s iPhone has changed the intellectual property (IP) landscape. Now, inventors beyond the technology sector are realizing the business value of design patents to protect their IP. Read more to learn how design patents can be used as a strategic tool to protect your outdoor recreation products. BACKGROUND: Historically, design patents (how a product appears when you look at it) have been overshadowed by utility patents (that cover how a product functions), and trade secrets (information a company wants to maintain as confidential) as a way to provide meaningful IP protection for a company’s product. There are pros and cons to creating design, utility, or both design and utility patents to protect a product. Typically, design patents are less expensive and faster to obtain than utility patents, but they provide a narrower scope of protection than a utility patent because only certain, limited features are protected (an inventor or manufacturer can attempt to cover the entire “article of manufacture” with multiple design patents). In the wake of Apple v. Samsung, the scope of protection available with a design patent has potentially expanded; and the damages available for design patent infringement may include lost profits, not just lost royalties. HOW APPLE v. SAMSUNG CHANGED THE DESIGN PATENT LANDSCAPE: Apple’s years long fight with Samsung over features of the iPhone appears to be a worthwhile litigation investment as damages awarded to Apple are predicted to be in the $500 M range. The case has highlighted the potential value of design patents and added teeth to a patentee’s ability to enforce its design patent rights to collect greater damages from infringers. The design patents at issue in the Apple v. Samsung litigation cover a variety of iPhone design features. One of the patents, U.S. Design Patent No. D593,087 (see representative figure below), covers a rectangular phone with rounded corners and a round “home” button at the bottom of the screen. Another Apple patent, U.S. Design Patent No. D618,677 (see representative figure below), covers the grid layout of icons on the screen of the smartphone. A third Apple patent, U.S. Design Patent No. D604,305, covered the icons on the screen. None of Apple’s design patents covered all of the iPhone’s features. The features shown in broken lines illustrate features not claimed by Apple as part of the invention – they provide context to better understand the covered design features. The court found that several of Samsung’s smartphones infringed Apple’s design patents because they included design features covered by one or more of the Apple design patents. 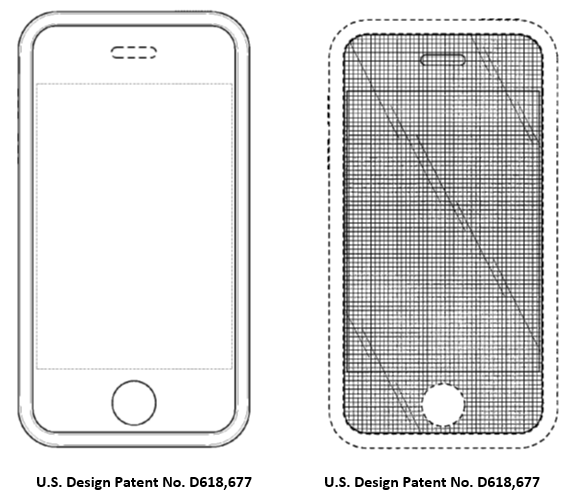 More broadly construing design patents than in the past, the court found the rectangular-shaped iPhone housing was a design feature protected by Apple’s design patent. But the game-changing aspect of the litigation was the court’s finding that at least some of the iPhone’s patented design features were so integral to the entire phone design that they could not be separated from the non-patented features. The design patents were found to cover the entire “article of manufacture,” protecting a broader scope of the iPhone’s design. This finding by the court allowed Apple to successfully argue that Samsung should turn over its total profits for the infringing smartphone sales, which resulted in a substantially greater damage award than is typically available for a design patent infringement, usually calculated on reasonable royalties of resulting sales. HOW CAN OUTDOOR REC PRODUCTS LEVERAGE DESIGN PATENTS? Let’s consider how the “design feature” versus “article of manufacture” patent might apply to an outdoor rec product, like a backpack. In U.S. Design Patent No. D809,799 (representative figure below) only a portion of the backpack product is covered by a design patent: the backpack strap features outlined in red solid lines define the patent’s scope of coverage. 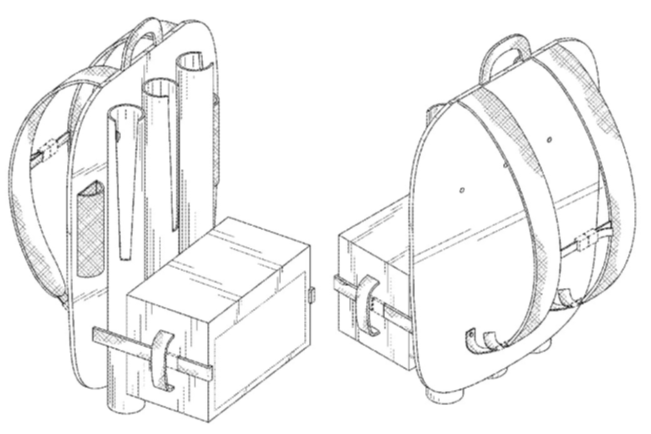 The black broken lines, representing the body of the backpack, are not covered by the design patent. A competitor’s product would infringe design patent ‘799 if the competitor’s backpack strap included similar strap features, even if the competitor’s backpack had other features. Because the design patent covers only one feature of the backpack, any damages recoverable by the patent owner likely would be limited to reasonable royalties, unless the inventor successfully argued (like Apple), that the straps were “integral” to the entire backpack design. 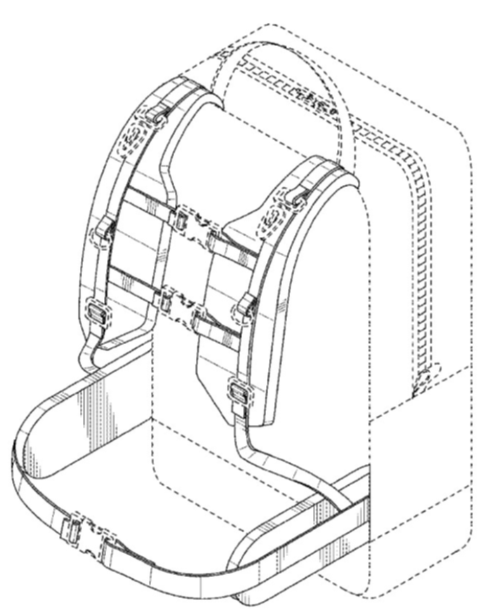 Another backpack product is shown in U.S. Design Patent No. D807,026 (representative figure below). Here, the entire backpack, outlined in red solid lines, is claimed to be covered by the design patent – an “article of manufacture” patent. The more expansive article of manufacture design patent has pros and cons for an inventor. If the article of manufacture design patent is infringed, damages are likely calculated on a loss of profits basis. But, an article of manufacture design patent is infringed only if a competing backpack includes every feature of Design patent ‘026. This means a competitor can easily design “around” the patent by changing only a few features. The tradeoffs related to the scope of a design patent should be considered when developing a design patent strategy for your outdoor recreation products. Lost profit damages may be recoverable from an infringing competitor if your design patent actually covers the entire article of manufacture; or a design feature is considered “integral” to the overall product design. Given the relatively low costs and shorter timeframes for obtaining design patents as compared to utility patents, design patents offer a relatively quick and cost-efficient way to obtain patent protection for your product and obtain “patent pending” status. Among other things, “patent pending” status can be an effective marketing tool as a well as a deterrent to potential infringers. Waiting to pursue a design patent until after your product has been launched, or even after releasing information about your product in a non-confidential setting, can impact your ability to obtain patent protection – inventors or manufacturers can inadvertently lose patent protection. Proactively discussing your options with a qualified patent attorney will help you avoid potential pitfalls and position you to maximize your patent rights in a competitive industry. Holland & Hart’s Outdoor Recreation team offers sophisticated expertise in design patents. We help nascent and established companies develop patent strategies so they can protect and enforce design patent and other IP rights. If you have questions about design patents and how they can be used to help protect your company’s valuable innovations, contact Josh Randall or another member of the Holland & Hart team.